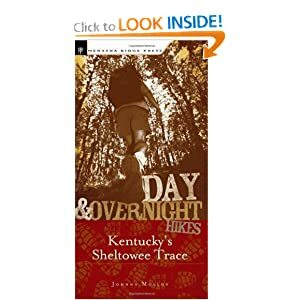 This book details the 282 miles of Kentucky’s master path, the Sheltowee Trace. This path was the 100th designated federal national recreation trail, dedicated in June of 1979. Hikers who tread this trail will be “following the turtle,” a white painted turtle blazed on trees, extending from the trail’s southern terminus in Tennessee’s Pickett State Park, north through the Big South Fork National River and Recreation Area and on through the length of the Daniel Boone National Forest nearly to the state of Ohio. Along the way, hikers will see the best of the Cumberland Plateau, from exquisite aches to bluffs that offer extensive vistas to waterfalls that descend into sandstone cathedrals. The path treads through deep forests in gorges cut by creeks and rivers and atop the Plateau, where oak and pine forests range long distances. Rock houses, caves and other rock features stand out in these rich woodlands. Some areas through which the Trace travels are set aside purely for their natural beauty, such as Cumberland Falls State Park, the Big South Fork National River and Recreation Area, the Clifty Wilderness, and Red River Gorge Geological Area. With the protection of these areas has come protection of the plants and animals that live here, including threatened and endangered species such as the red-cockaded woodpecker, Virginia big-eared bat, freshwater mussels, and white-haired goldenrod. The black bear has made a comeback in these parts, expanding its range into eastern Kentucky from neighboring states, as well as being reintroduced into the Big South Fork. Starting at Pickett State Park, the Trace starts off with a bang, passing spectacular natural features amid an everywhere-you-look beauty. In its first mile, ST passes a waterfall, an arch, and a rockhouse while making its way through the Hidden Passage. Rocky vistas are had from Thompson Overlook before reaching the Big South Fork National River and Recreation Area and Rock Creek, a designated Kentucky Wild River. The ST then reaches Mark Branch Falls, an 80-foot veil of water dropping into an amphitheater of sandstone. Mining history lies ahead along Grassy Fork. Here the Trace follows an old mining railroad grade before reaching the big water of the Big South Fork. The Big South Fork River corridor offers sights of its own, such as Yahoo Falls Scenic Area. Yahoo Falls, the highest waterfall in the state of Kentucky at 113 feet, is the centerpiece of this picturesque spot. A set of side trails lead past rock monoliths, Yahoo Arch, overlooks and other cascades. Beyond here, the trail continues along Lake Cumberland, then heads up North Fork Big Creek where the Sheltowee Trail makes a 180-degree curve beneath a deep rock shelter while being serenaded by a waterfall. The Trace keeps north along the Cumberland River to see Kentucky’s most powerful falls, Cumberland Falls, roar over a sandstone ledge, then meander through a boulder garden of designated state wild river beauty in the Cumberland River gorge. The Trace leaves the Cumberland River Valley and heads east over to Laurel River Lake, curving along coves and bays through pine-oak-hickory woods. Beyond Laurel River Lake, the Trace enters the rugged Cane Creek watershed, where rockhouses, waterfalls and sandstone bluffs await. The Sheltowee Trace then enters the Rockcastle Hills and the superlatively attractive Hawk Creek Valley. Join the famed Wilderness Road beyond Cromer Ridge, which Daniel Boone and thousands of future Kentuckians followed to settle the Bluegrass State. Climb past Wildcat Mountain Battlefield National Monument, site of Kentucky’s first Civil War engagement, then walk high ridge of oaks and hickories before spanning the Rockcastle River to join Kentucky 89, a designated Kentucky Scenic Byway. The walking picks up beyond Turkey Foot, as the Trace enters War Fork gorge. Pass Resurgence Cave, from which War Fork flows. Turn away from War Fork via Alcorn Branch, passing rock shelters and a waterfall. The Trace travels the little-visited Copperas Cave Branch basin, before road walking along big Sturgeon Creek to reach Heidelburg and the Kentucky River. Later, the Trace traces high Big Bend Ridge with views from the “The Narrows,” a narrow rock strip. The Trace enters Natural Bridge State Park, with its Natural Bridge and Balanced Rock, among other natural features. The ST reenters national forest land and nears massive Whittleton Arch. Ahead lies the famed Red River Gorge Geological Area and its accompanying crowds. Here, the Trace runs along high ridges with views, before dropping into Chimney Top Creek and spanning the Red River, Kentucky’s only federally designated wild and scenic river. The Trace heads up the rugged north side of the Red River Gorge past spectacular rock houses, small creeks, over a rocky ridge with far off views and by an arch. The Trace drops into the Clifty Wilderness. Clear Creek Recreation Area lies in the lowlands, where a fishing lake borders the remains of an historic iron furnace. Leave Clear Creek and resume ridge walking far above Cave Run Lake, an impoundment of the Licking River. The Sheltowee Trace is the master path of a trail network covering the western shore of the Cave Run Lake. North of Cave Run Lake Dam the Trace winds along the spine of narrow wooded ridges, over knobs and down to gaps. Hikers can look back on Cave Run Lake before dropping off to Triplett Creek and lush bottomland. The Trace makes a final extended ridge run before reaching its northern terminus near the upper end of North Fork Triplett Creek. Through hikers will savor this spot, as it marks the completion of Kentucky’s master path. Kentucky is lucky to have been an early forerunner of the long trail movement, the Sheltowee Trace. This long trail movement is expanding all over the United States, joining such paths as South Carolina’s Foothills Trail, the Florida Trail, and the Benton MacKaye Trail, named for the man with the original idea for the original long trail, the Appalachian Trail. In other areas, national forest personnel set about laying out long trails of their own, such as the Black Creek Trail in Mississippi’s De Soto National Forest and the Pinhoti Trail of Alabama’s Talladega National Forest. Rangers of Kentucky’s Daniel Boone National Forest were primarily responsible for development of the Sheltowee Trace. Hopefully, Kentucky’s master path will continue to evolve and improve for the better, making the Bluegrass State proud of its own long trail.